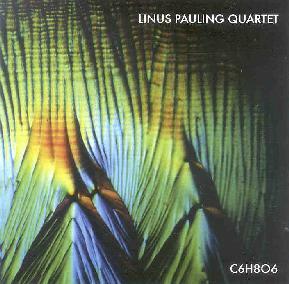 Wow... there are few similarities between the latest Linus Pauling Quartet album and their previous effort, the 2000 release, Ashes In The Bong Of God. Whereas that album was a free-wheeling, tripped out, playful quest for the bong, the new C6H8O6 to a large extent dispenses with the freeform improvisational feel for structure, songs, and some of the most crushing ROCK of the year. The opening track, "Switzer", might as well have been called "Howitzer". It's a balls-to-the-walls spaced out Stoner dirge with ripping trip guitars, a sludge laden bottom end, and alien freakout synths. It's always fun getting your skull crushed when you least expect it. "La Tapatia" is a wild combination of satanic death metal and power rockin psychedelia. "Cole Porter" comes close to being a pop song... at least until the words "Rock out now!" signal the space metal assault that comes whizzing out of left field. The psych-metal continues firmly in the garage on the rambunctious "Drunkest Man". "Cannonball" catapults the band into pure pub rocking thrash territory with a strong boogie-woogie Blues edge. Those who prefer a more jamming psychedelic experience will enjoy "Brain" and "Airplane". Absolutely killer guitars on both songs, and "Airplane" takes off into total rockin' mindfucked freakout heaven. And the jamming continues on the nearly 12 minute "Thorn", which opens with strumming acoustic guitars, a dirty rockin' Bluesy feel, and a catchy melody to go along with it. But it leaps outside the box with the addition of clarinet, cello, viola and congas. So we're drifting along for a few minutes and then POW!!! Chest shattering guitar chords lay it on thick and mucky, spraying a wall of aggressive drone metal, though all the while retaining the spirit of the rousing acoustic song that opened the track. It's a strange combination of rock anthem and stoned metal that grows on me more with each new listen. Finally, the nearly 16 minute "Hall Of Mirrors" in many ways summarizes the whole album, covering a lot of ground, though the best parts are the gorgeously thick space guitar assaults that are hard and heavy but oh so dreamy... and take off deeeeeep into the cosmos. In summary, this is a monstrous set of spaced out metal and ultra heavy psychedelia that will appeal to anyone who likes.... well... spaced out metal and ultra heavy psychedelia. It covers lots of territory, combining varied elements but into a completely coherent whole. Highest recommendation. For more information you can visit the Linus Pauling Quartet web site at: http://www.worshipguitars.org/LP4/index.html. C6H8O6 is distributed by September Gurls Records. You can visit their web site at: http://www.septembergurlsrecords.com.